My fondest memories of of Paris are not of my Bateaux Mouches cruise down La Seine, my visits to Le Louvre, Le Musee d'Orsay or ascending to the top of La Tour Eiffelle. Nope, my fondest Paris memories are of our many visits to creperies, which literally could be found on every street corner. 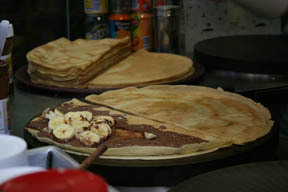 For me, nothing says Paris like une crepe au chocolat avec banane, tres yummy! Here is one of my favorite pictures from the 400+ I took on the trip - it speaks for itself. They're fairly easy to make. Its basically Nutella and sliced banannas slathered on a thin pancake and folded into fourths, garnished with a generous topping of powdered sugar and served in waxed paper - the ultimate street food. This page contains all entries posted to veronicafung.com in May 2007. They are listed from oldest to newest.